Welcome to the White Station High Class Of 1989 website. $89 per person for all events. Pay wshs89@gmail.com via PayPal. Tours of WSHS will take place on Saturday, June 22 between 10 - 12. A student will lead it from the lobby next to the main office. White Station High School Class of 1989 will be holding a 30 year class reunion in June of 2019! The WSHS Class of 1989 Reunion Committee is asking that you please be a part of this exciting event by becoming a business supporter. A graphic advertisement with a direct hyperlink to your company website on our reunion website at www.whitestation89.com, which will be posted for at least one year. An advertisement with a direct link to your company website on our reunion Facebook page. We will also be printing reunion memorabilia, such as t-shirts and banners, in which your company logo will appear. Special recognition in reunion emails and during the reunion event itself. You will receive TOP advertisement listing on all advertising modes. You will receive FREE admission for yourself and a guest to the Saturday Formal event. You will receive secondary advertisement listing on all advertising modes. You will also receive FREE admission for yourself and a guest to the Saturday Formal event. You have the opportunity to name your own level of sponsorship – no less than $50, please. Please let us know you're interested in helping us contact classmates, or in volunteering during the reunion by e-mailing us at wshs89@gmail.com. The Twenty Year Reunion is over, and we had a blast! Stay Tuned for information on the Twenty-Fifth Reunion!!! 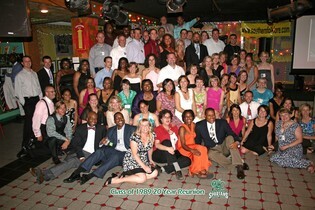 And, please tag White Station-Alumni in your reunion photos on Facebook!